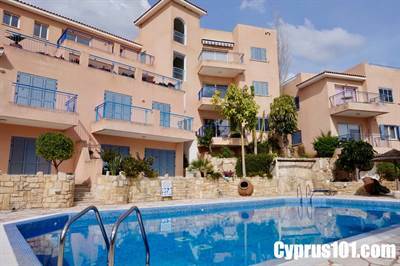 This well presented 2 bedroom, 2 bathroom apartment is situated on a small luxury complex within easy walking distance to the newly renovated village square, which has a good variety of restaurants and tavernas. The main town of Paphos and the coast are an easy 10 minute drive away. The accommodation features an L-shaped living room with comfortable lounge, dining area and well equipped kitchen. Sliding patio doors in the lounge provide easy access to a covered balcony with stunning sea and rural views. The master and second bedroom are both double size and feature fitted wardrobes and en-suite bathrooms. A private covered balcony accessed directly from the master bedroom, overlooks the quaint village street which meanders down to the traditional Tala square. A large store room located near the covered parking area is a great bonus and is ideal for storing bikes, golf clubs, tools, etc. The communal facilities are well maintained and include a luxury mosaic tiled swimming pool with surrounding sunbathing terrace, toilet and shower facilities and beautifully landscaped gardens. This Tala apartment is ideal as a holiday home/rental investment, comes fully furnished and has title deeds.